Do you really think her campaign is in THAT much trouble? I personally hope Barack wins, or at least makes it on a ticket. I think Hillary's machine is awfully powerful though. Hey, he's not running for VP, that's Biden's job. Actually, Bill's appearance and what he said made me feel that Hillary is in trouble more than any polls indicate. But, the polling does show Hillary in decline and Edwards, Richardson and Obama on the rise in the first 3 states. 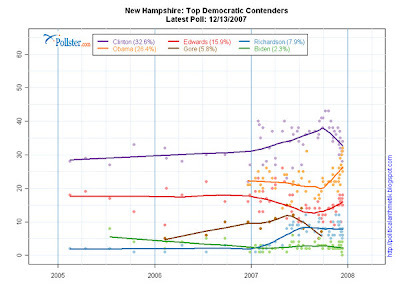 It also seems that Obama and Edwards share many of the same voters, so if one drops, the other gains significantly. These things, combined with the Oprah effect in the South, make Obama very strong. I've been predicting a Hillary/Obama presidency in '08, but it's starting to look like I put the wrong name at the top of the ticket. Biden's ho-hum at best, and Edwards sounds like he's trying to remain relevent while struggling to differentiate himself. Neither adds much to any ticket. Republicans are preoccupied internally, trying to reclaim the fiscal conservatives who they have abandoned. Mitt & Rudy resonate with them, but not with religious conservatives. Huckabee's just the reverse. Unity on the right has been fractured by this, so they won't generate the kind of enthusiasm among their base that the Democrats will among theirs. Putting Hillary in at VP could neutralize her substantial negatives, while maintaining the full effectiveness of the Clinton machine. She'd never go for it, but she may have no choice. If the voters choose Obama in the primaries, all her other options are worse. It's hard to imagine her turning down a chance to be on the winning team. Mark, can you tell me why the right will not support McCain? I just don't get it. I see Hillary and Mitt as two sides of the same coin. Both of them would say anything to get elected, and no one really knows their true position. I think Guiliani and Huckabee are eminently defeatable by any of the dems. Then you have Ron Paul, Thompson and McCain. To my mind, McCain is the man who has the best chance in the general election. Of course the general election could go any which way if a strong third party candidate runs, like Bloomberg. It is the Dems election to lose. By the way Mark, Obama will definitely NOT run with Hillary. I would suspect he would choose Richardson or Biden, but who knows. An Obama/Clinton ticket, with either one on top, wins the white house easily. Hillary without Obama wins, but it's close. Obama without Hillary loses big. The Clinton machine will make sure of it, because she isn't going to wait 8 years for another shot. It really is the Dem's election to lose, and I can't see either of them risking a loss by not running with the other. McCain is a Republican, but not really a conservative. He has never given the right a reason to support him. He hasn't given them any reasons not to either. He pays occasional lip service to the core conservative issues like taxes, spending, values and freedom, but you never get the feeling that he means it. He's so middle of the road, that he might actually peel away a few Dems if he made it to the general election. But he won't. Republicans only win when they line up all the conservatives, including the fiscal & religious right, the Buchanan xenophobes, and the black helicopter crowd. McCain's ambivalent about all those groups, and it's mutual. None of the other Rs can assemble the whole team, so this election season is destined to be a rebuilding year. I keep waiting for a Democrat to make a play for the fiscal conservatives. If they could pull it off, it would destroy what's left of the Republicans, but evidently it's not in their DNA. I think Hillary is the one that could lose it for the Dems. You repubs keep wanting Hillary to win! Looks like Zogby agrees with you Mike. According to their polling, Obama is currently leading all 5 Republican hopefuls, and McCain would run best against him. Meanwhile Hillary's trying to figure out how best to spin her anticipated loss in Iowa. Didn't Bill lose Iowa in his run for the Whitehouse? Wow. Obama wins Iowa by nearly 10 points in a record turnout. Edwards and Hillary battle for distant 2nd and 3rd. Meanwhile Republicans have record low turnout, and only religious conservatives showed up. Fiscals remain in the wilderness with no champion in sight. It looks our discussion here is beginning to play out in real life. Congratulations on Obama's big win! Good luck in New Hampshire.